This coat of arms "Honni Soit Qui Mal Y Pense" tapestry shows a royal crest in beautiful detail. The words are from 'The Most Noble Order of the Garter' which is the highest order of knighthood in England, created in 1348. The words are in old French and mean "Evil on him who thinks evil" and represents the reverence for the quality of chivalry and noble intent. The order was formed by Edward III and an insignia with these words are thought to represent the age of chivalry where chivalrous behavior and valor were thought to be at their height. 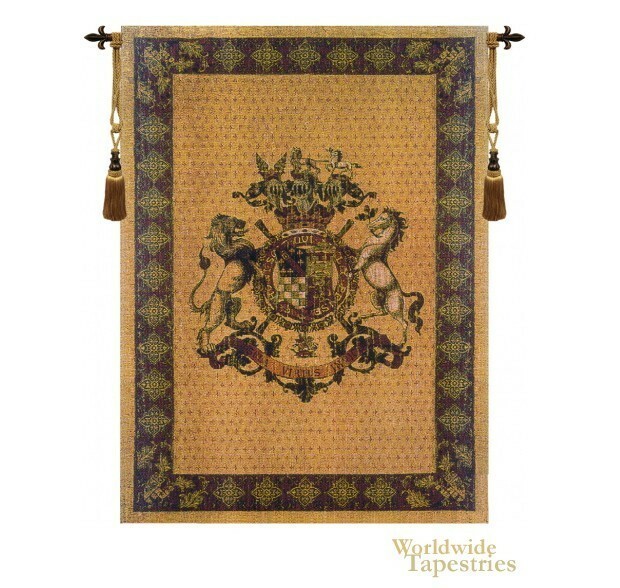 Here, in this royal crest tapestry we see a beautiful royal crest of lion and horse surrounding the heraldic design itself with details including acanthus leaves and eagle. Honni Soit Qui Mal Y Pense tapestry is unlined, and has a tunnel for easy hanging. Note: Tapestry rod and tassels, where pictured, are not included in the price.